These colorful orchids brighten the landscape and the greenhouse. With their vivid long-lasting flowers, vigorous growth and forgiving nature, it would be difficult to name an orchid more ideal for the novice grower than a reed-stem Epidendrum. They have sometimes been called the poor man’s orchid for several reasons. They were affordable and widely available during times when most orchids could be cultivated only by the wealthy. They are easily propagated, yielding many plants from one stem; and they are tolerant of a wide range of growing conditions including outdoors. They also have the advantage of being relatively free of insects and flowering reliably throughout the year. If you are new to orchid growing, with a reed-stem Epidendrum you can enjoy a riot of colourful orchid blooms all year with minimal care. Plants of the diverse genus Epidendrum are native to the tropical Americas, from South Carolina (Epidendrum conopseum) south through Mexico and Central America to Argentina. These orchids are extremely variable in habitat requirements. They can be found at elevations from sea level to 12,000 feet, growing in climes ranging from seasonally dry tropical forests to grassy slopes in full sun to hot steamy jungles to cool, damp cloud forests. Most are epiphytic, many are lithophytic and still others are terrestrial. They are now worldwide in distribution introduced and naturalised in most subtropical and tropical countries, including well-watered yards in Southern California and in South Florida. Often people have been growing these orchids in their yards for years without realising it. The number of species in the genus varies depending on which taxonomist you ask. At one time, the genus Epidendrum included those plants now classified as the genus Encyclia (around 250 species), Oerstedella (40 to 70 species, many in isolated areas and perhaps extinct in the wild), Psychilus (15 species) and Nanodes (30 species), which includes the species Epidendrum porpax and Epidendrum medusae. Current estimates place the number of Epidendrum species at around 900. Look for strong, healthy, well-established plants with little or no spotting and no colour distortion on the stems or leaves. A vigorous root system with actively growing root tips at the surface of the potting mix and down through the drainage holes is ideal. Many reed-stem Epidendrum are susceptible to a leaf spotting fungus that causes round brown spots on the undersides of the leaves, but which does not seen to adversely affect the health or flowering of the plant. Choosing a plant with new plantlets attached to the stem brings a bonus. Many Epidendrum develop Keiki?s (Hawaiian term for “babies”), which are new vegetative growths produced on old stems and flower spikes. Once these Keiki’s develop their own 2- to 4-inch-long roots, they can easily be detached from the stem and planted individually in pots. Before acquiring any orchid, it is essential that you understand your own growing conditions, and then compare those with the plant’s requirements. Carefully consider what temperature range, light level, humidity and water quality you can provide. Determine if the plant will be grown indoors or outside and how much growing space you have available. Know how many times a week you will be able to water. Have your water analysed to determine if it has a high level of dissolved salts and minerals, which are detrimental to the health of some plants. (Salt build-up appears as a crusty white residue on the pot, roots and the leaves.) True reed-stem Epidendrum are tolerant of poor water quality. Some Epidendrum, however, are sensitive to damaging salts and other minerals such as iron, and need rainwater or deionised water to thrive. As a general rule, warmer-growing plants found at lower elevations are more salt-tolerant than high-elevation, cooler-growing species that generally receive pure rainwater in their native habitats. If your local water supply is high in salts, you may want to consider a reverse-osmosis (RO) system or collect rainwater for those plants sensitive to water quality. If you are unsure about your water, you may want to contact you local water department for an analysis. Reed-stem Epidendrum grow readily in almost any setting, whether in a pot, mounted on a cork slab, or in raised flowerbeds outdoors, as climate permits. Some volunteer plants have even sprouted on the roof of the greenhouse. These orchids require copious amounts of fertiliser. When fertilised regularly they respond immediately with denser flower spikes, greener, stronger leaves and more robust roots. Use any balanced fertiliser according to manufacturers’ recommendations. Plants grown in lower light (such as inside in northern climates) need less nitrogen; high nitrogen fertiliser in low light will result in long, leggy, straggling growths. Reed-stem Epidendrum need bright light, even full sun, for strong, sturdy growths. These orchids are generally forgiving of water frequency and quality. Be sure to water copiously, letting water drain out of the bottom of the vessel, to prevent mineral build-up in the mix. Keep the roots moist year round, but, as for most orchids, do not let the plant sit in water. They can tolerate a wide range of temperatures and most can handle near-freezing conditions. As a rule, provide day temperatures of 60 to 90 F (and 30 to 70 F at night). In northern latitudes, move the plant outside after the threat of frost has passed, being careful to avoid sun burning the leaves when moving plants outside in the spring. At the first hint of frost in the autumn, bring the plants indoors, but be sure to check for and remove any insects. Note that Epidendrum cinnabarinum and many of its primary hybrids are not tolerant of low temperatures (below 55 F) for extended periods. To keep your reed-stem plant tidy, remove old flower spikes and stems down to the base by snapping them clean with your fingers or cutting with sterile clippers. This makes room for strong, new basal growths, while discouraging Keiki?s from forming that produce shorter, smaller spikes and turn into messy, tangled plants if left untended. Plants grown in low light may need to be staked, while those growing in full sun are usually self-supporting. When growing outdoors in raised beds, you can mix many colour forms of the same species, if desired. However, combining several species in one bed or tub often leads to competition and overgrowth of one species to the detriment of others. In subtropical and tropical climates, reed-stem Epidendrum makes handsome container plants for patios and pool areas. For Epidendrum secundum, Epidendrum radicans and Epidendrum ibaguense, almost any planting mix will do, because these are extremely tolerant of soil conditions. These three species make a spectacular display in raised planter beds or in tubs or pots. You can use old potting mix from your other orchids for potting these Epidendrum, but it should be sterilised. Otherwise, use a potting mix, or make your own mix or large or small bark amended with any combination of perlite, moss, charcoal, sand or gravel. Either a plastic or clay pot is fine (clay needs watering more often). Repotting or replacing raised beds is generally not necessary, although plants do need to be top-dressed with additional mix as the mix decomposes or is washed away during watering. For Epidendrum cinnabarinum, and Oerstedella and their hybrids, it is best to choose a fast draining mix of one part medium bark, one part fine bark, and one part perlite and replace the medium every 12 to 18 months. Reed-stem Epidendrum grown outdoors are relatively free of insects. Occasional encounters with aphids can be treated be spraying with an insecticidal soap or Orthene 75 percent WP (wettable powder), thoroughly covering flower heads and new growths. Follow the directions for repeat applications. A slug or snail can make a meal or several flower heads in a single night. The new, non-toxic iron-phosphate-based slug and snail bait (available as Sluggo or Escar-Go) appears to be effective slug and kind to humans and other inhabitants of a yard. It is safer and longer lasting than other snail and slug killers, such as metaldehyde, and equally efficient. Ant colonies in the potting mix or nearby will often lead to scale infestations the can be difficult to eradicate. Sprinkle Diazinon around the perimeter of the plant, carefully following the manufacturer’s instructions and safety recommendations. In a greenhouse, mealybug can be problematic on new growths and developing flower spikes. Treat the entire plant by drenching the pot and thoroughly spraying the new growths with insecticidal soap or Orthene 75 percent WP, being sure to follow the application schedule recommended by the manufacturer. Reddish, shrivelled foliage indicates poor root health, most likely due to the root fungus Rhizoctonia. Infection can be controlled using Benomyl-related compounds such as Clearys 3336 WP or Ban-Rot, the disease is best prevented in the first place by regular re-potting in fresh mix. Foliage that is distorted or streaked in irregular patterns, in checkerboard shades of green becoming black squares with age, could indicate the plant is infected with a pathogen such as Tobacco Mosaic Virus (TMV). Irregular colour and streaking patterns on the sepals or the petals of the flowers could be a sign of Colour-break Virus. If you suspect a plant is infected with virus, I recommend destroying it, or at least isolating it from the rest of your plants. Plant viruses are spread by fingernails, aphids and other sucking insects, as well as by using non-sterilized cutting tools or pots. You can use disposable latex gloves when handling and repotting your plants to minimise the risk of cross-contamination. There is currently no treatment for these plant viruses. Reed-stem Epidendrum are floriferous. In the rare instance of a reluctant bloomer, the most common cause is not enough light. Relocating the plant to a spot where it receives as much sunlight as possible and fertilising regularly should remedy the problem. Epidendrum secundum (Andes of South America) has an upright, clumping growth habit with roots emerging from the base of the stems, at or below soil level. It readily forms Keiki’s on old flower spikes. The leafy stems range from 1 to 30 inches, producing a ball of 30 to 40 brilliantly coloured 1-inch flowers on 18 inch terminal spikes. Colours range from white to yellow, pink, orange and purple, and all shades in between. A well-grown plant produces abundant spikes throughout the year. It benefits from fertiliser, and thrives when grown in full sun, in a rich, fast-draining humus mix. It will tolerate temperatures down to freezing for brief periods, but not below. Epidendrum radicans (Mexico to Panama) possesses a low-lying, freely branching growth habit, producing roots along the length of the stem. Stems range from 4 inches to 2 feet in length, producing upright terminal 6 to 15 inch tall spikes with up to 10 vivid, reddish-orange, 1-inch flowers that are open at any one time. The flowers open in succession over several months, with up to 40 flowers per inflorescence. It does well in full sun to partial shade. This species is tolerant of temperatures down to freezing. Epidendrum ibaguense (Colombia and Venezuela) grows like Epidendrum radicans, but clumps more, with roots emerging on the lower half of the cane. Arching branches up to 18 inches, with flower spikes another 18 inches, end in a dense head of 1-1/4 inch reddish-yellow to purple flowers with a yellow lip. There can be up to 50 flowers on a stem, with 20 open at a time. The species has an especially attractive growth habit and grows quickly, filling containers rapidly. It takes full sun to partial sun in hot climates, and can tolerate temperatures down to freezing, but not below. Epidendrum cinnabarinum (Brazil) is a robust, erect and clumping plant, resembling a large Epidendrum secundum, often reaching up to 4 feet. The 30-inch-tall flower spikes produce dense heads of up to 40 flowers, with as many as 10 open at one time. Flowers are large, up to 2 inches, coloured orange to red to pink with a yellow lip. Ideally, this plant is grown outdoors in full sun in South Florida and Hawaii. Snap back stems to base after flowering. This species is particularly susceptible to root fungus (Rhizoctonia) when stressed by cool temperatures. It is tolerant of only short periods of cold (night temperatures below 55 F). Some species of Epidendrum have been transferred by taxonomists to the genus Oerstedella, although they are still widely known and sold as Epidendrum. 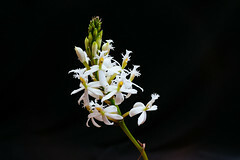 They are distinguished from other Epidendrum by their unique flower structure and growth habit, thin leaves and warty leaf sheaths that cover the stems. They range in height from 6 inches to 14 feet. These thick rooted plants are generally epiphytic, with the larger species being terrestrials. Brightly coloured, 1/2 to 1-1/2 inch flowers in many colours typically last up to several months. Most of these are intermediate to cool growing (60 to 85 F during the day and 48 to 65 F at night). A 10 to 15-degree drop at night is beneficial . They require frequent watering because of their thin leaves and narrow stems, and can desiccate quickly in hot climates if not well-rooted. They thrive with high humidity and air circulation, and are sensitive to water quality. Oerstedella in pots are highly susceptible to Rhizoctonia root fungus, which can be best prevented by repotting every 12 to 18 months. Oerstedella pseudowallisii (Panama and Costa Rica) is free-flowering year round. Plants are up to 24 inches tall, flowers appear on short spikes, are well rounded with heavy substance, in shades of pale, creamy yellow with red spotting and a white lip, and last for two to three months. This is a warm to intermediate grower. Oerstedella centradenia (Costa Rica) is compact and vigorous, but can also be a rangy grower, with stems 8 inches on average, although some reach 3 feet. It flowers from late winter to early spring, bearing dense heads of 1-inch lilac flowers on short spikes that last two months. It grows well potted or mounted, and yields Keiki’s freely. It is tolerant of heat and cold. Oerstedella schweinfurthiana (El Salvador) is an aggressive terrestrial, reaching 15 feet. It flowers from midsummer to autumn on spikes with more than 100 rounded flowers that last up to three months. The sepals and petals are suffused with orange-purple inside, purple outside, yellow-tipped sepals, lavender lip. Easy to grow, it thrives in full sun. This species is frost hardy to a least 28 F.
These Epidendrum are easy to grow and make a spectacular sight. Epidendrum raniferum (Mexico to Central America) and Epidendrum pfavii (Costa Rica and Panama) are two species that produce upright canes to 4 feet, with pendulous heads of flowers that emerge on the same canes year after year (so do not cut them). Epidendrum raniferum’s 2-inch flowers are light green, finely spotted red with a white, four-lobed lip, and last all summer. Epidendrum pfavii sports 1 1/2-inch hot-pink flowers. Epidendrum pseudepidendrum (Costa Rica and Panama) is free-flowering year round. Its upright canes can reach 5 feet. This warm growing species is not cold tolerant, and is extremely susceptible to leaf-spotting. The astonishing long-lasting flowers have apple-green sepals and petals, and a waxy orange lip that feels like moulded plastic. Do not remove spikes after flowering as they will re-bloom year after year. Epidendrum parkinsonianum (Mexico and Central America) and Epidendrum falcatum (Mexico) have unusual pendent freely-branching growth habits with falcate, succulent leaves up to 20 inches. These plants tolerate both heat and cold, and will grow in bright light to shade. Mount them for best results. Epidendrum parkinsonianum produces up to eight 5-inch star-shaped green flowers with a white, three-lobed lip. Epidendrum falcatum bears 3-inch flowers that are white with a slight blush. Both are fragrant at night and bloom in the late spring. Reed-stem Epidendrum pay many dividends in the garden or greenhouse; they are easy to care for, affordable, widely available, tolerant of diverse growing conditions and are robust growers with many flowers in every colour of the rainbow. Epidendrum can reward the orchid grower with a wealth of brilliant flowers all year long.